Once endodontic therapy is completed your tooth should be examined periodically, usually every 6 - 12 months. This allows us to make sure the tooth has healed or is healing properly. You will be sent a notice in the mail when we feel it is appropriate to re-evaluate the area. 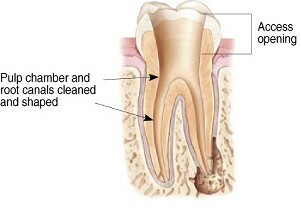 Since an abscess may take 2 years to heal, our office will re-evaluate the tooth for at least 2 years. Nothing is as Good as Your Natural Tooth. To make the appointment as easy as possible, a local anesthetic will be gently given. A sheet of latex called the "rubber dam" (we've got nonlatex ones too) will be placed around the tooth to keep it clean and dry during treatment. The treatment consists of three or four basic steps, but the number of visits will depend on your particular case. Some treatments take 2 visits and many are just a single visit. Occasionally 3 appointments are needed. The number of visits depends on the degree of infection/inflammation and degree of treatment difficulty. It’s most important to gain the very best resolution for your particular dental problem so the condition of your tooth will guide our time requirements. One piece of good news is that we value your time and do our best to begin your treatment promptly at your appointed time. There are, of course, no guarantees. Root canal or endodontic therapy has a very high degree of success. Modern research shows success rates as high as 98% when ideal treatment outcomes are obtained! We will discuss with you the chances of success before any endodontic procedure to help you make an informed decision. 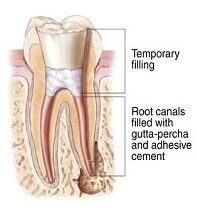 If a root canal or endodontic therapy is unsuccessful or fails you still have options to preserve a healthy dentition. Does a Root Canal ever Require Additial Treatment? Occasionally a tooth that has undergone endodontic, treatment continues to be uncomfortable or fails to respond to the therapy. Although rare, sometimes a tooth initially responds to root canal therapy, but months or years later can become diseased. When this unusual circumstance occurs, the tooth often can be managed and saved with a second endodontic treatment, called "Retreatment". Under certain conditions a Retreatment will not be the ideal course of treatment. It may be determined that the tooth may be best treated with a surgical approach. An apicoectomy is a procedure in which the endodontist opens the gum tissue near the tooth to see the underlying bone and to remove any inflamed or infected tissue. 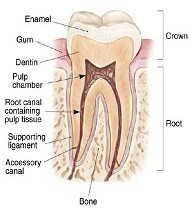 The tip of the root is removed and a filling is placed into the tip to seal the canal. From Auto Accidents, to Hockey Sticks, and Sudden Falls – Can a Traumatically Injured Tooth be Saved? Pulp damage is sometimes caused by a blow to the mouth, and the Endodontist specializes in treating these traumatic injuries. For example, a blow to a child's permanent tooth that is not fully developed can cause the root to stop growing. A procedure called apexification stimulates bone to be deposited at the end of the root which makes it possible to then save the tooth through a root canal procedure. An Endodontist is specially trained in procedures for replanting permanent and pediatric teeth that have been loosened or knocked out of their sockets.